For those concerned, worry not, there's still bacon bread here. 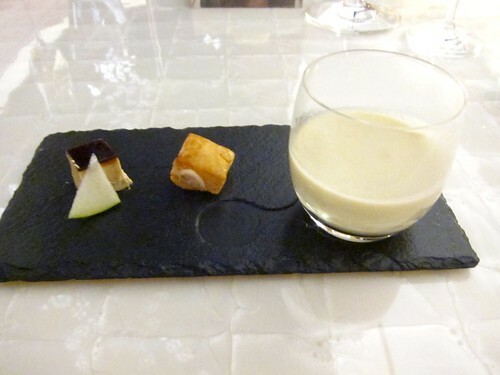 For our amuse bouche: a creamy romanesco soup, puff pastry, foie gras torchon with apple slice. I took Wandering Chopsticks along with me, and each of us received a different dish per course, giving us more opportunities to taste. For the first course, I had the Blue Fin Tuna Belly with Huckleberries, paired with 2008 Clemen Vinho Verde. 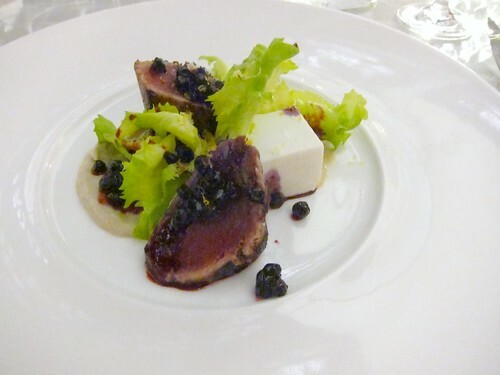 I really enjoyed the juicy huckleberries which were in the forefront of the flavors here, and the celery coconut gelee rounded out the textures. 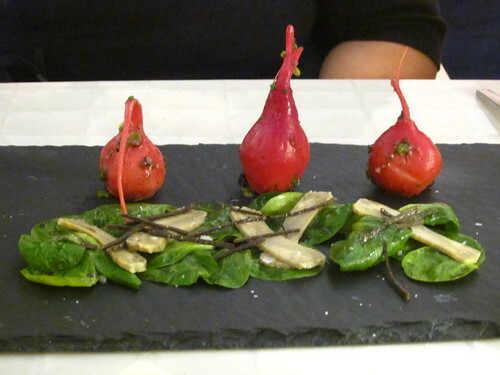 These beets were unlike the ones I usually have (you know, the ubiquitous beets with goat cheese) and the earthy artichokes and white truffle aroma were a great combination. 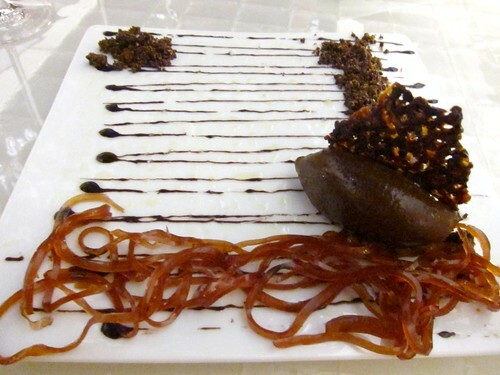 Féau may not focus on molecular techniques, but he seems to like to play with textures, as exemplified in the next course of salsify roots, and the variation of chocolate textures in the dessert course. 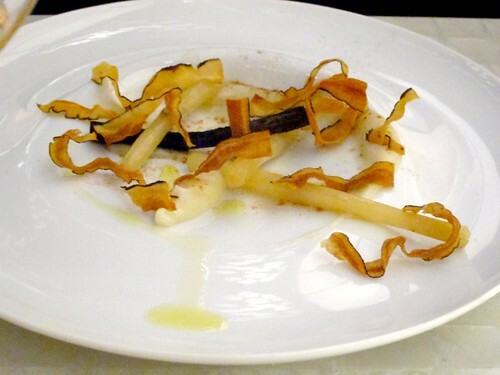 Salsify Prepared Four Ways | Braised, Braised and rolled in leeks ash, Pureed with goat cheese, fried "tagliatelle". Paired with 1998 Kalin Cellars Semillon (Livermore Valley). 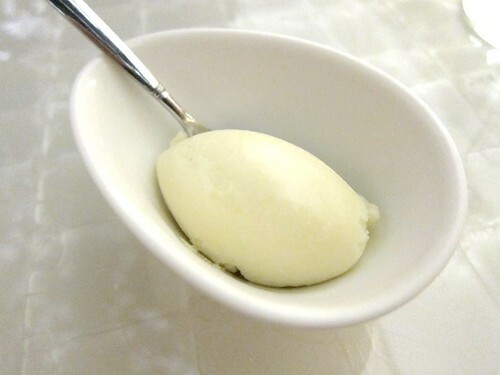 The waxy and earthy Semillon complemented the earthy and tender salsify roots quite well. Absolute love. The poached lobster was sweet, the texture was amazing. 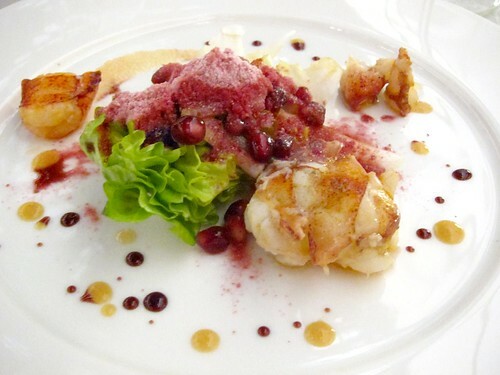 The tartness of the pomegranate was surprising and yet seemed to be just perfect. What followed was a pair of delicate courses with broth poured tableside. 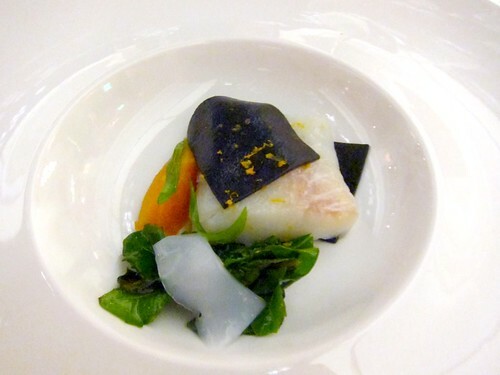 day boat blackburn chatham cod, squid ink spaghetti, autumn greens, romano squash, citrus dashi broth. Espuny draws on the minerality of the Chablis for this pairing. 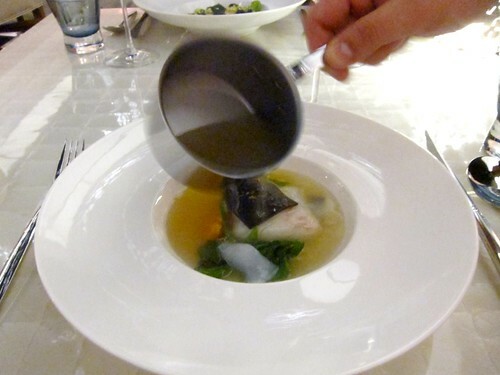 The juicy and flaky cod is accented nicely by the dashi flavor, nothing overwhelms each other but blends together. 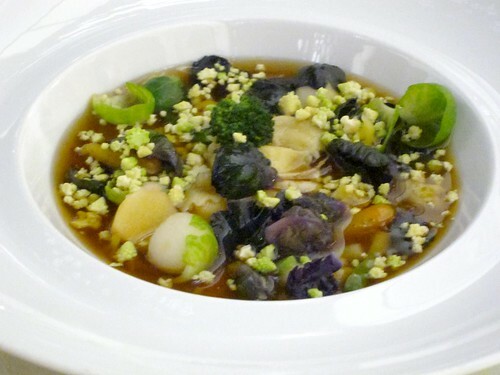 Agnolotti filled with Parsnips, Vegetables, Mousseron Mushroom Veloute, Sorrel leaf. 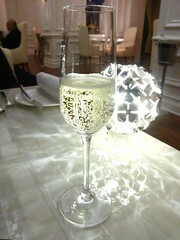 This was paired with a glass of red, a 2007 Lagone Aia Vecchia, to bring out the smokiness of the broth. The al dente agnolottis were great, but we loved all the greens sitting in the broth the most. I couldn't help cleaning off the bowl to the last drop. This was one of my favorite dishes of the night (a vegetable dish, it's true!) and perhaps my favorite pairing as well. 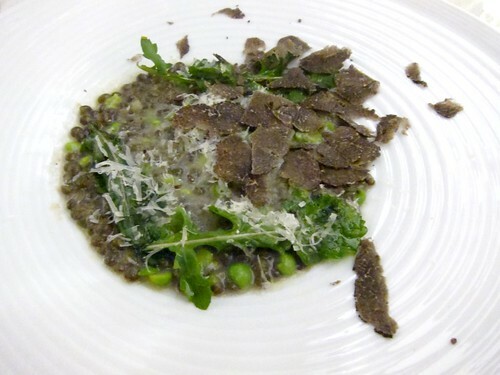 Eaten with the rich, warm lentils, the aroma of the truffles opened even more.The peas added a sweetness that brings it all together. 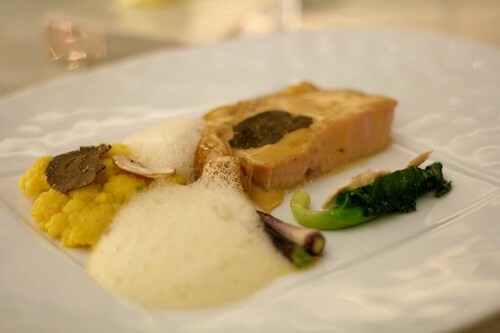 The veal was particularly tender, contrasting nicely with the crisp romanesco. This was WC's favorite dish of the night. The jelly here had a light sour taste. It did cut the richness of all the other chocolate items, but I'm not sure if I'm a fan ... 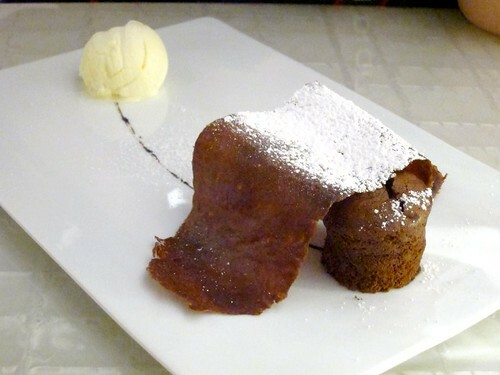 I liked the second "variation" much better: Chocolate cake with fleur de sel, chocolate tuile. To top it all of, we had more chocolates! 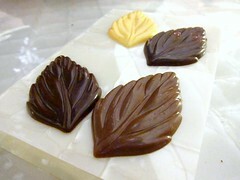 These leaves were made with: dark chocolate with fleur de sel, milk chocolate with espresseo, and white chocolate with espelette. 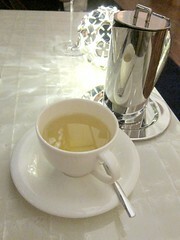 To go with the chocolates, I asked for some hot green tea. 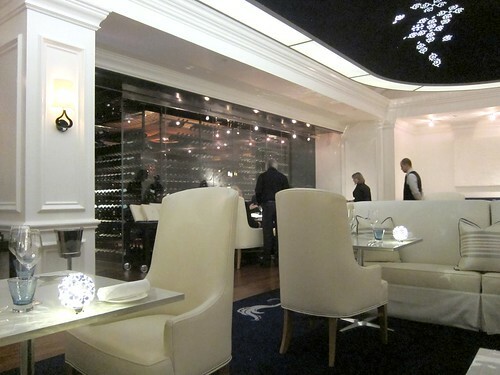 We sipped and savored our meal in the new swank dining room. 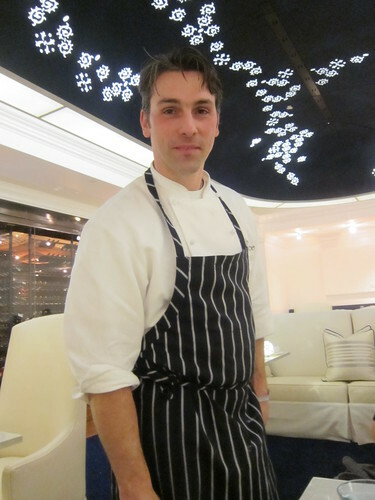 The Langham came back strong with Féau manning The Royce, executing one delectable dish after another. The front of the house supports his works well with courteous and timely service and Espuny's diverse and well thought out pairings. 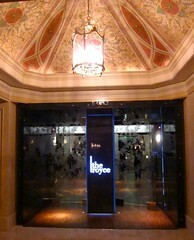 Your dining experience isn't just about the food, luckily - at least based on my experience - The Royce has their game down on both ends. Yay! I can cheat and get notes off of you. Thanks for taking me along. That was one of the nicest meals I've had in a long time.